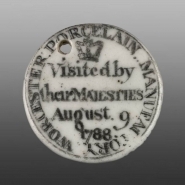 The other side of the medallion is printed in black enamel with a crown, surrounded by an inscription: WORCESTER PORCELAIN MANUFACTORY Visited by their MAJESTIES August 9 1788. This porcelain medallion is printed in black enamel with the head of King George III, crowned with a laurel wreath. The portrait is surrounded by the inscription: GEORGIUS III DEI GRATIA. It was made to commemorate a visit made by the King and Queen in 1788 to the Worcester porcelain factory. For details of the visit see Aileen Dawson Worcester Porcelain (2007) p196. The medallion is pierced by a single hole. Only two of these commemorative medallions are known to have survived: this example in the British Museum and another in the Museum of Worcester Porcelain.